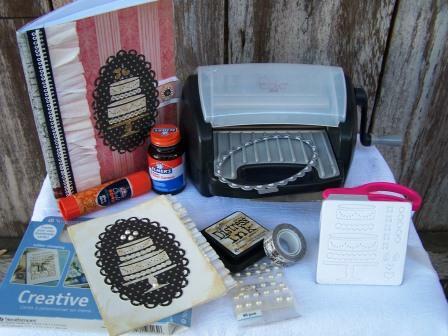 Lifestyle Crafts new dies and letterpress kits! Modern and sweet take on the cake die - a simple silhouette on a pretty pink damask backdrop. A more vintage-inspired look created with distress ink, a streamer ruffle, and beautiful papers. (all kinds of FAB hearts!). That project is happening a little later. 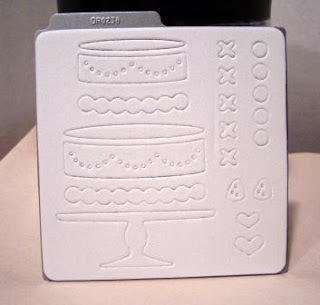 For my first project I used the cake - you know how I LOVE weddings, so I used the cake die slightly different than they show on their site, I love this die, but I wanted some more height so it looked like a wedding cake (you can see the example above). Best thing is - you can use it either way! 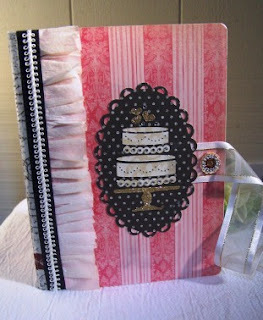 I first made a wedding journal - I kept notes or ideas and thoughts as I planned my wedding many, many years ago and I still have it...so I thought this is a great gift for any bride...or mother of the bride. NOTE: I used quite a few different things I had on hand. The photo just shows the basics for creating these projects. 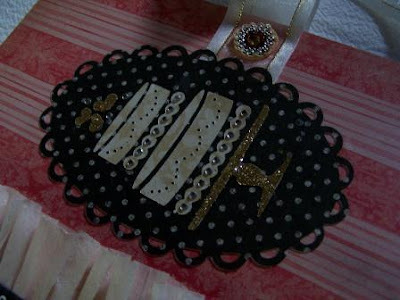 Embellishments: rhinestones,glitter, fabric trim, ribbon, etc. 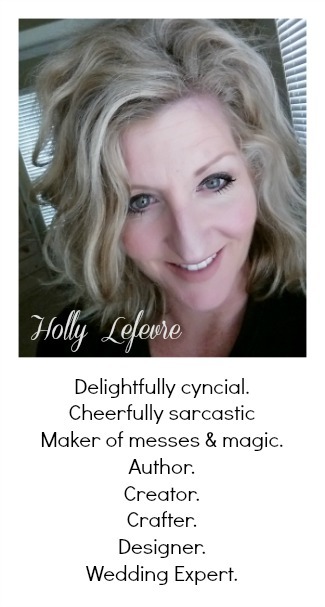 - whatever you have on hand that sparkles and is pretty! 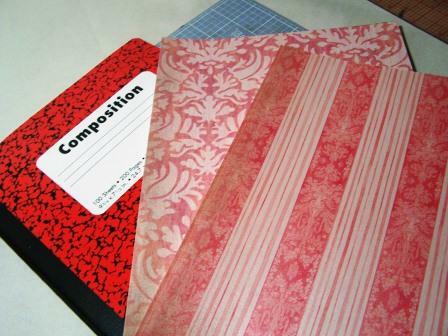 I used the basic method of covering a plain composition notebook (you can also use a sketch book too) that I used when I made the Dream Journal. Basically you are simply cutting 2 sheets of decorative paper for the outside and 2 for the inside (slightly larger). Use the covers to measure. 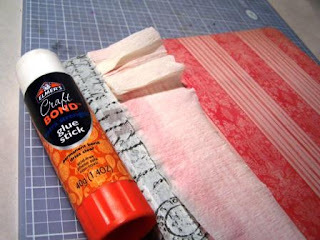 Affix them to the existing cover using a glue stick or rubber cement, let dry. Trim as needed. You can leave the spine alone, or cover with paper (washi) tape. I bought mine at Aaron Brothers. 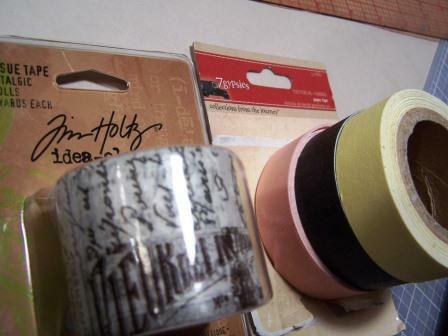 Trim the tape up. Decorate and embellish. 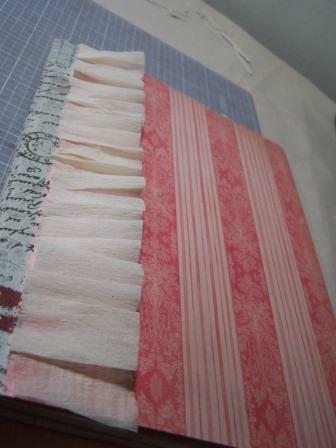 I used I mixture of paper tape, fabric trim, and a streamer ruffled/pleated. Then topped it with the star of the show..the cake atop the Eyelet Oval! To make the ruffle: run a line of glue along the spine/tape edge; glue down a length of streamer and then just pleat, using the spine/tape line as a guide. 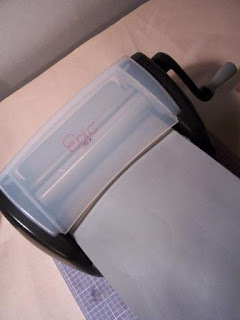 Press down; trim at the end, cover with ribbon or paper tape, etc. First I used the Nesting Eyelet Oval in a contrasting paper for a backdrop. The I cut the cake out all in one color. I glittered the stand and hearts by covering it in glue and then sprinkling it with glitter. Place the cake die pieces on the Oval and then glue into place. I added rhinestones for some extra sparkle! Sandwich a ribbon between the oval and cover and glue down. Embellish as you see fit! I also thought this die makes a great card pr invitation - and it can be super simple, but with great STYLE! 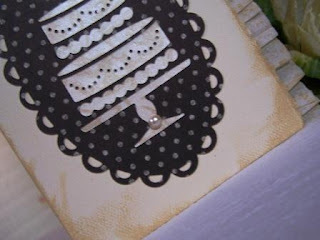 I again used the Nesting Eyelet Oval and the cake. 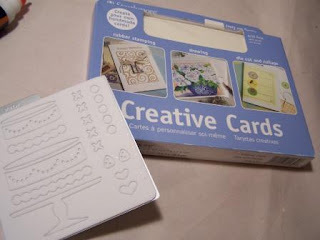 - love these cards - a staple in my craft hoard! 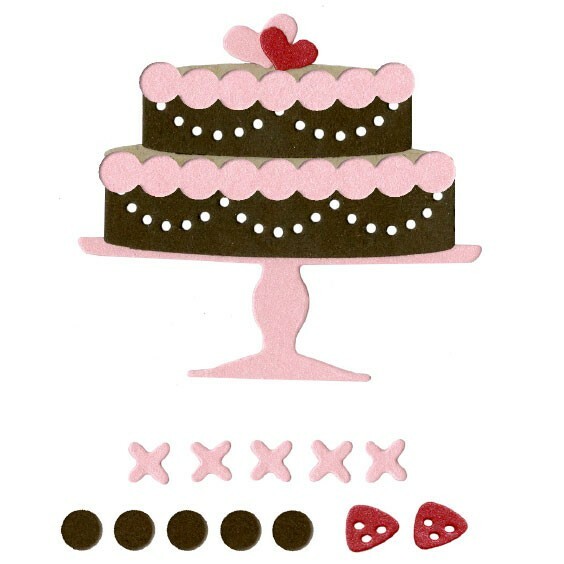 One version is more modern - a pink damask oval with a silhouette of a cake (in black), top with a little girlie charm of a pearl, and some tasseled ribbon" - contemporary and girlie! The other version is more vintage -inspired. 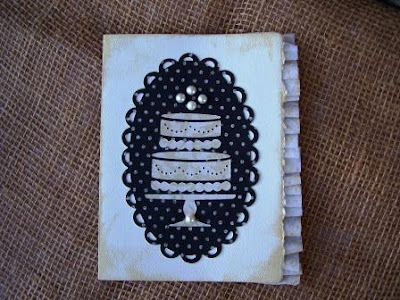 I distressed the edges using distress ink in antique linen, cut an Oval out of a vintage-look black dot paper and then the cake out of a pearlized damask. 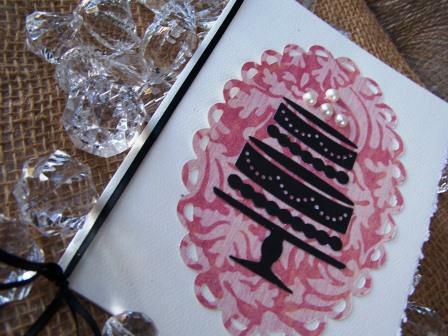 A few more pearls for some fun and then, ruffled the stream again (after rubbing it in distress ink) - I just applies glue to the inside cover of the card and pleated/ruffled the streamer with only about 1/2" peeking out the front. 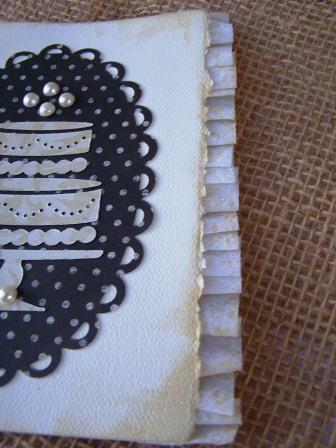 Sandwich with a piece of card stock cut to fit the inside of the card! What are you making for your sweetheart???? I love the creations. Too cute! I am especially in love with that modern damask and the silhouette of the cake. Very fun. 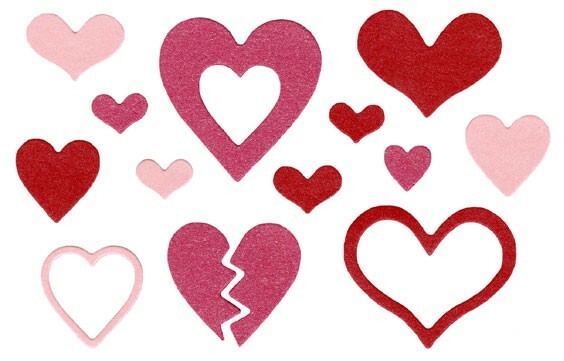 I am so ready to see Valentines Day crafts and NO MORE Christmas!